Camped in the mud in a construction site overlooking the Fraser River, with trains roaring past, freighters loaded with crushed cars headed out to china and freighters full of new cars headed in, and eagles gliding overhead. 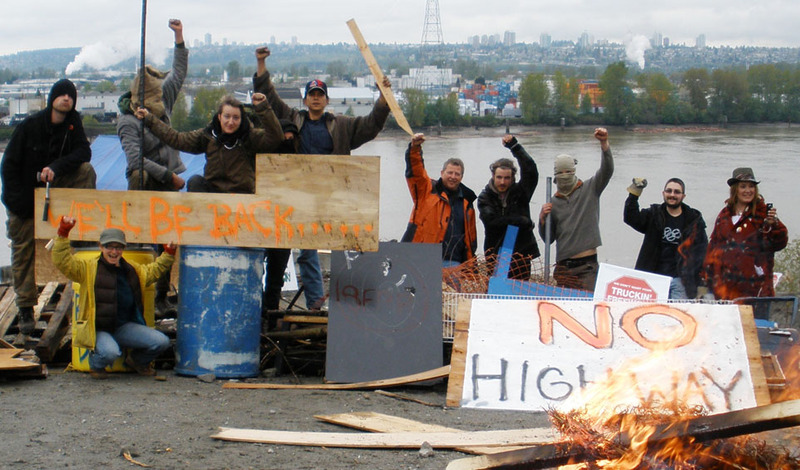 Holding down the Direct Action camp in Delta for 2 weeks has been a mind-bending experience. Surreal, and sublime. The really humbling part, that part that makes me cry, is the diversity of the people united only by a passion for truth. I watched my own prejudices and preconceptions melt, as the same process was mirrored between everyone around me. The black-flag East Van anarkids, the solid Council of Canadians activists, a few funky hippies, the Ladner and Surrey moms and dads and just…everybody…sitting in circle, standing together. Who would ever have thought. After two weeks of occupying the site, the construction company served notice that they were going to file an injunction to force us out. My own impulse was to stick it out and face the music, riding the wave of publicity and media attention – I’ve been fighting this so long, it felt (to me) like the time, and I am hungering for showdown. Impatient. 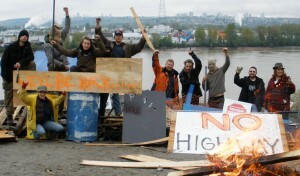 But the group concensus was to strike the camp, move it on, and reserve energy for the next action. I trusted to the collective intelligence and now in retrospect I know that it was the right decision. Energy is high, spirits are good, and we go forward to the next step. Noami said “Well, when its all said and done and crumbled to dust, all you ever have left is the relationships you made.” Or at least, all that is left are the marks those relationships have made. I am feeling these new psychic tattoos. Next Notes from a Bicycle Bodhisattva – may all beings be liberated! Thank you all for trying. it doesn’t feel like “trying,” it feels like doing. it feels good. Can this road (eventually) be stopped? I hold out every hope it can still. Was thrilled to see this action commence. Was envisioning a really long sit-in a la Clayoquot. If the prov election is called this fall, and NDP takes it – will Mr. Dix stop the project? In the meantime, to continue to fight it is the only thing to do. Thank you Eric, Carmen & all who made this camp!